TREBBE JOHNSON is an author and frequent speaker on the relationship between people and nature. Her previous books are The World Is a Waiting Lover and 101 Ways to Make Guerrilla Beauty, and she has won many awards, including the John Masefield Award from the Poetry Society of America and a Telly Award for a video made for the UN on the 20th anniversary of Earth Day. She has led workshops, retreats, and rites of passage programs internationally since 1995, such as a retreat in an old-growth clear-cut forest, a ceremony at Ground Zero after September 11, and a walk in weapons testing grounds at Eglin Air Force Base. 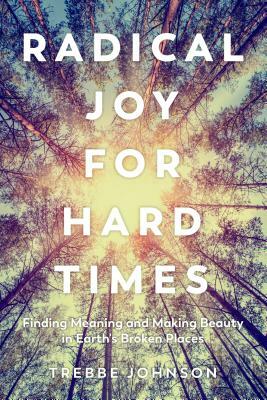 In 2009, Johnson founded the non-profit organization Radical Joy for Hard Times, dedicated to finding and making beauty in wounded places. She regularly speaks at a variety of events, from the Stephens College Commencement to the Parliament of the World's Religions to the Sierra Club. Johnson is a contributing editor at Parabola Magazine and an active member of the Wilderness Guides Council, the Florence Shelly Stewardship Committee, and SCAN (Susquehanna Clean Air Network). She is married to Andrew Gardner, an artist, and lives in rural northeastern Pennsylvania. "Engaging and intense, this book demonstrates vividly how contemplative approaches to life are profoundly political. Deeply embedded in how we respond to mass extinction—which is the least euphemistic way of putting what is now happening in the biosphere—is a habitual conceptual severing of our necessarily symbiotic relationships with other lifeforms. This severing forms the very structure of how we have taught ourselves to enjoy 'landscape.' In showing us how to appreciate differently, Trebbe Johnson shows how to repair the severing, which traumatizes humans as much as it traumatizes nonhumans, step by contemplative step."